Breaking my dissertation and administrata induced silence for a small rant combining two of my favorite things – Apple Computer Inc, and simulation. Recently, the New York Times featured the article ‘Apple Confronts the Law of Large Numbers‘. The fundamental assertion? That the earnings growth and stock price of Apple cannot continue its rapid rise. The justification? The Law of Large Numbers, and the idea that as Apple grows larger, each additional % increase in earnings, profit, etc. represents a bigger and bigger step in terms of the absolute dollar amount. One problem: That’s not how the Law of Large Numbers works. More after the jump. the law states that a variable will revert to a mean over a large sample of results. 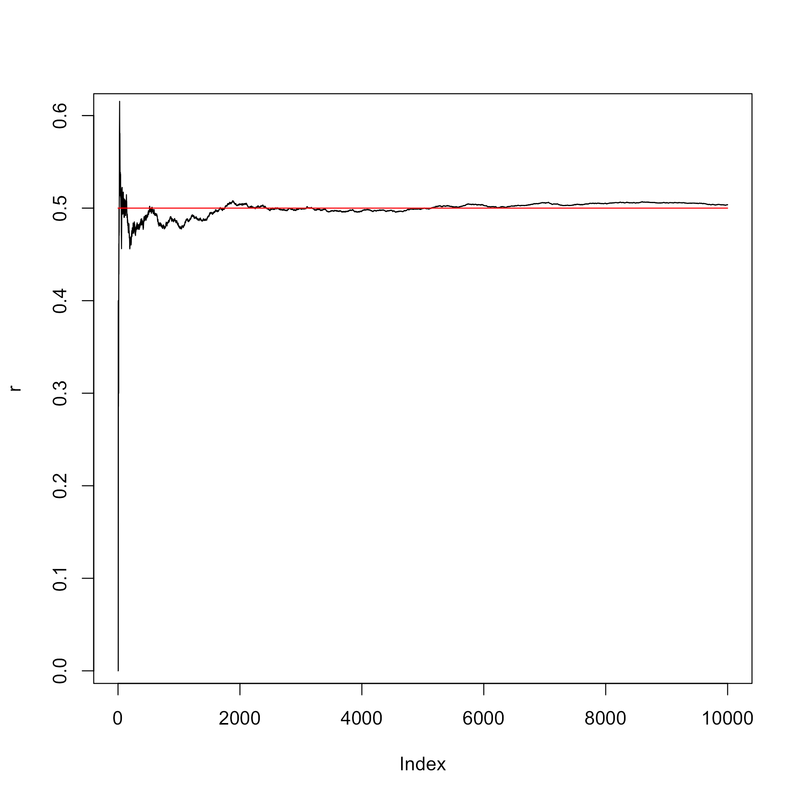 The black line is the cumulative average, with the red line being the known mean the simulation should converge to over time. Notice how after 1, 2, 10 or even 1000 coin tosses, the average isn’t 0.5. After 10,000, it’s considerably closer, but still not necessarily there. After many, many more? That is how the Law of Large Numbers works, and its the underpinning behind most simulation work – that with enough simulations, you should converge on the actual expected value, even if it isn’t known – or (unlike our coin toss example) its hard or impossible to arrive at analytically. But this has nothing to do with Apple’s performance, past, present, or future. The company’s earnings, share price, or profits aren’t a random process. That it becomes progressively harder to deliver the same % increase as a company grows larger isn’t wrong, but it isn’t the Law of Large Numbers. Just because 500 billion is a large number (and in dollar terms, it is a very large number) doesn’t mean that’s what operating. There are many, many reasons to wonder if Apple’s trajectory can continue. Has it lost its small, lean operating patterns now that it’s the largest company in the U.S.? Can it continue without Steve Job’s driving personality? Can it keep its track record going? After all, eggs aren’t the only thing that comes out of a golden goose. Disclosure: I own stock in Apple. And am rather fond of simulation.